"The Wretchedness Inside", the new video from Florida metallers TRIVIUM, can be seen below. The song is taken from the band's latest album, "The Sin And The Sentence", which was released in October 2017 via Roadrunner. The disc was recorded with producer Josh Wilbur (LAMB OF GOD, GOJIRA) at Santa Ana, California's Hybrid Studios. The LP features the band's first recordings with new drummer Alex Bent, who joined the band in 2016. 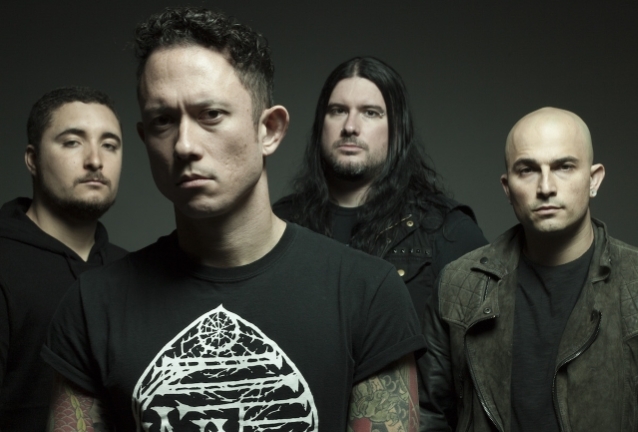 TRIVIUM frontman Matt Heafy spoke to the "That's Not Metal Podcast" about the fact that it has been difficult for the band's core trio — Heafy, guitarist Corey Beaulieu and bassist Paolo Gregoletto — to keep a drummer in the last few years, prior to the addition of Bent. "The drumming is what the band is built upon, it's the foundation for which all the music is built upon, and if you don't have a strong foundation for a house or a building, it eventually collapses," Matt explained. "And I'm so thankful that the stars finally aligned, after eight records, to find the guy that we needed to find. And I think that when people hear Alex, it's not a question of 'Why?' It's more like an observation, like, 'Oh, I see you did it again, but I know why.' Because he's that freakin' good." TRIVIUM will continue its successful "The Sin And The Sentence" world tour with another leg of North American dates this fall. The bill will feature very special guest AVATAR and LIGHT THE TORCH. The 25-date trek kicks off on October 3 in Tampa, Florida and runs through November 3 in Berkeley, California, with several stops in Canada.